Going camping this summer? Don't forget to take some camping chairs. I've been camping my whole life, heck I even got married in a camp ground. One thing is for certain, you need to have comfy camping chairs to sit in, most campgrounds have picnic tables if you get there early. If not you might not even get a table if other campers come and take your table first. And then you have the bird poop, yes disgusting but the birds usually hang out looking for whatever food campers leave behind and the best place to hang out is on the picnic tables. We always bring our own camping chairs when we head out. 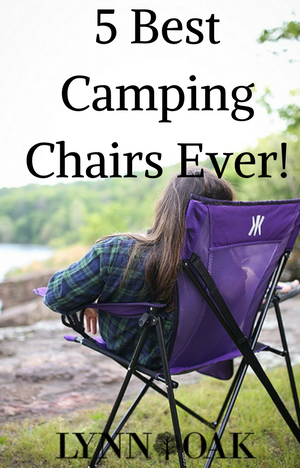 I'm in the market for some new chairs I'm excited to say I found 5 of the Best Camping Chairs Ever! Come check it out with me. I picked these chairs based on the years I've been camping. Some chairs are cheaply made and won't hold up. I pick out 5 that had high buyers with great feedback. I've read customer comments on all of these, making sure they were not defective. I've even added one with an umbrella on it. Some campsites don't have any shade, so your stuck out in the sun. That's when a little shade on your chair will be extra nice. I picked this chair because it was made by a brand I buy all the time. The are a great company and they make a lot of quality things for camping. Customers are very happy with this chair. It's over large that even a very tall person can sit in it with comfort and it is made very well. Bonus it has a cooler on the side. Just big enough for 3 bottle waters or can drinks. They even said it was comfortable to sit in. That's what I want in my new camping chairs. I picked this chair because it's purple. I love that color! So that's what I seem to gravitate to most of the time, when I make a purchase of something. These have good reviews and bad reviews. So it's a 50/50 on this one. But most say it is the most comfy one they ever sat in. I love that! But then some said that some kind of mishap happened on the first day. Sometimes you have to look at the dates of these reviews. The most recent review at this writing said that they go to sporting events all the time and this chair was the very best they have ever owned, even for someone pushing 300 lbs. This company must have made improvements in the chair. I really love that it comes in Purple. One person did say to wait until they go on sale. I really like the one that has the metal fold out tray. That makes it great when you're eating, you have a place to put your food and drink. What I really like about this one, is that it has a full back. I've had a chair like this that didn't have the full back and it makes your back hurt after awhile of sitting in it. I also love that it has a pouch on the other side for all kinds of storage. I could store my extra bottle of water, some snacks even my camper keys in the zip pouch. I really like this one too! I have a love hate relationship with these. I want one but I feel like I'm falling when I sit down in one. But once I get settled then I'm happy to be in it as they are very comfy. Getting out of them is the same thing. You're kinda see sawing a bit to get in or out of them, which I really don't like. If you can get past that then this is a great deal. You get 2 for the price of one. I've been looking at this kind of lounge for years and in the camping magazine they are over 100 bucks a piece. All the reviews are raving about them, how comfy they are and you just can't beat the price. I picked this chair because it looks super comfy and it has an canopy with it. Great for those days when you are sitting out in the sun. I like that it has a little foot rest, which most don't have. One person had a great tip for using these when you can't move your chair to escape the sun. Clip on a sun scarf to the side of the canopy. Great Tip!